Earlier this week I made something insanely delicious. And I just simply couldn’t keep it a secret anymore. 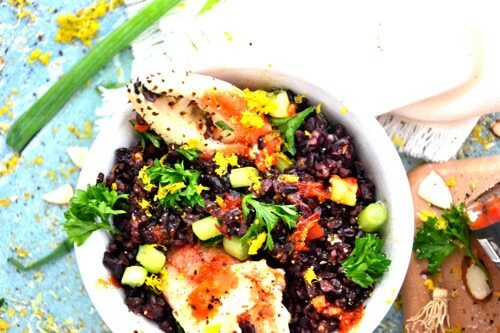 I’ve been counting the days ’till Friday so that I could share this new black rice recipe with y’all. 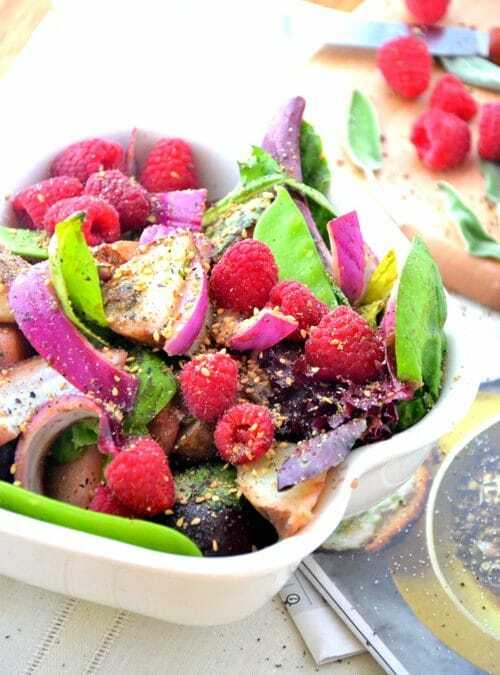 And now that Friday is here- I’m all smiles because this recipe is gunna rock your world. 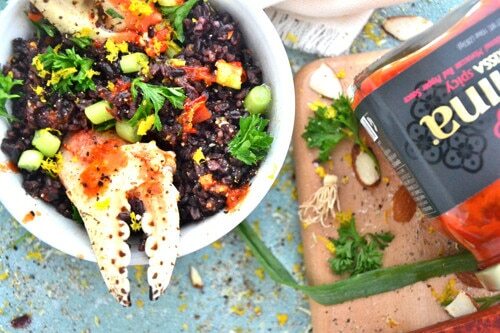 Black rice and crab claws are a match made in heaven. Most of you have probably had crabs- but believe me, you’ve never quite had ’em quite like this. 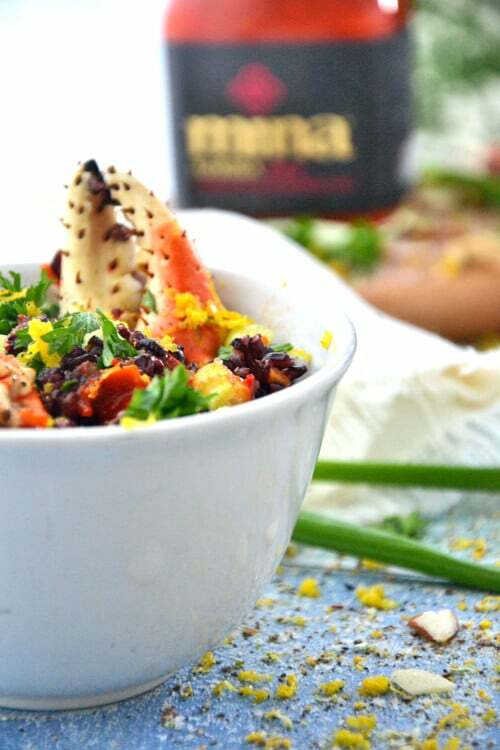 Have you ever tossed rice n’ crabs with a bit of spicy harissa sauce? I didn’t think so. It was totally new for me, too but now that I’ve tried it I think I’m hooked. The flavor! It was tender and spicy. 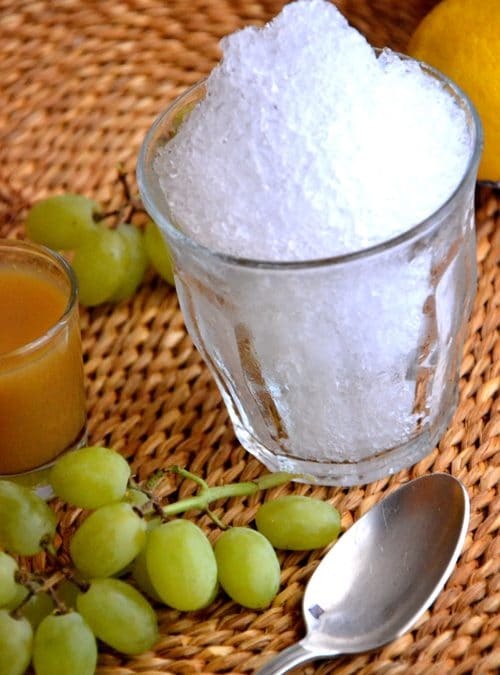 And you totally need to make this tonight. When I was a young girl, my mother, sister and I went crabbing. We crabbed all day and then came home for spaghetti and crabs. But those were the rinky dink blue claw crabs- nothin’ like these here monster claws that I am just loving. The blue claw crabs didn’t have much meat to them but these snow crabs are the meatiest little suckers I’ve ever seen- well they’re almost as good as lobster. I opted for rice instead of spaghetti because it’s always good to switch things up, isn’t it? 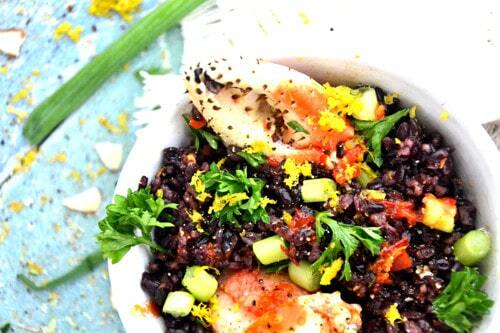 I topped my black rice with lemon zest, parsley, scallions and mina harissa sauce. Yes, I am obsessed with this stuff- it’s spicy but boy o’ boy does it taste good. This dish would be great with any toppings but I’ve been on a harissa sauce kick as of late so I tossed in a bit for some pizazz. So, go ahead. 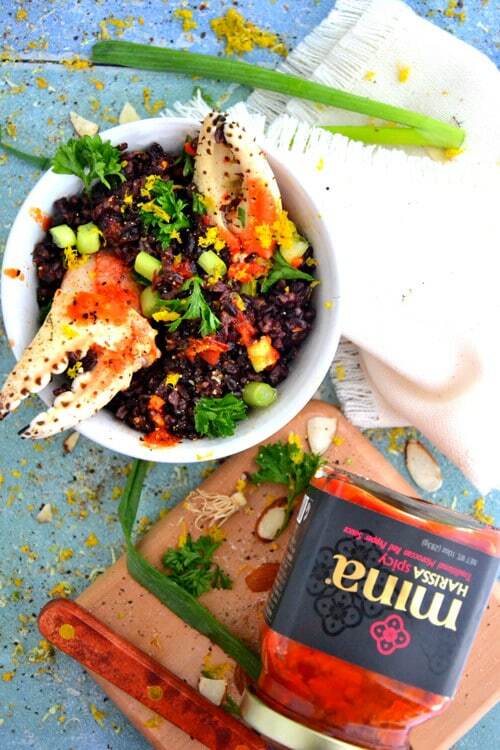 Mix up your dinner tonight and toss a lil’ snow crab with some easy-peasy black rice. Don’t say I didn’t warn ‘ya. It’s addicting. 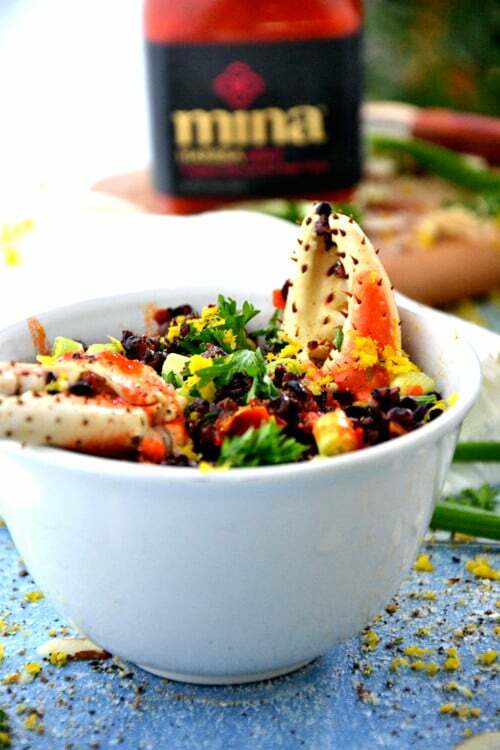 In a large pot of boiling water, cook crab claws for 2-3 minutes or until pink and well done. Drain water; set crab claws aside. 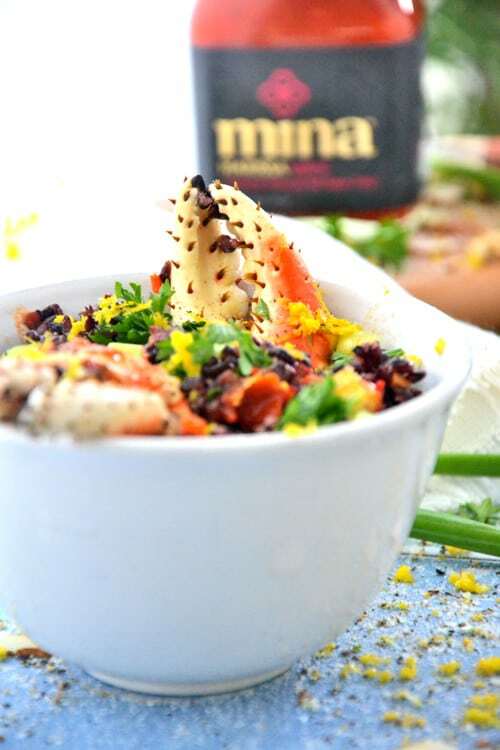 In a large bowl, combine all ingredients except crab cocktail claws; gently toss to combine. 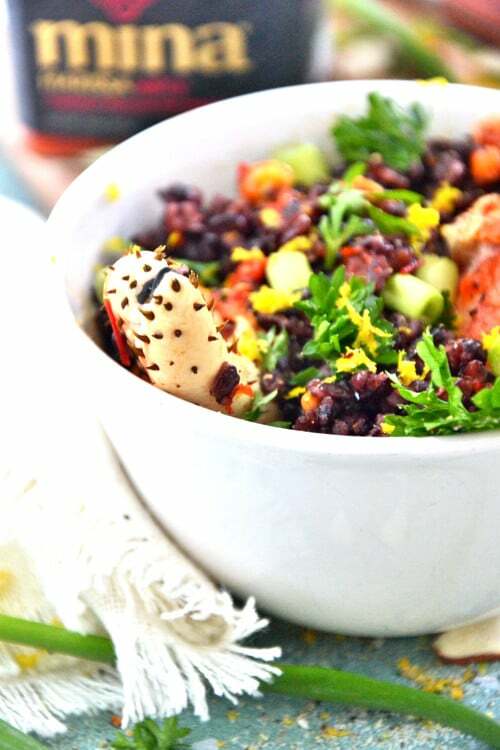 Transfer rice mixture into four serving bowls, place two crab claws into each bowl. Serve warm with a dollop of yogurt. 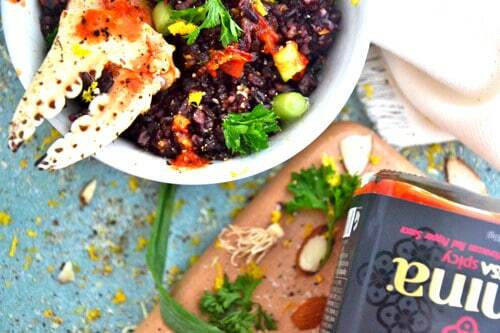 AMIE THIS RECIPE LOOKS GREAT IS THE HARISSA SAUCE GLUTEN FREE AND EASY TO PURCHASE. PLEASE LET ME KNOW I WOULD LOVE TO TRY IT. HAVE A GREAT DAY! Hope you enjoy it! I love the hot and spicy and they are coming out with a green one, too! Have a fabulous weekend and thanks again for your comment! You had me at the first picture 🙂 Stunning. Oh yum! 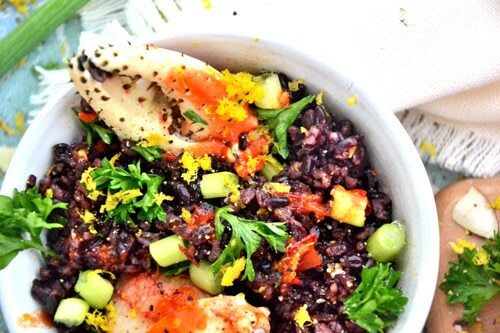 Huge black rice fans in this house too, all of us. Reminds me I need to hit up my favorite supplier when we’re next in the city :). Mind sharing where you get your crab claws? Not a staple in my pantry, but I do love crab! Never heard of Harissa sauce, but I know I will totally love it! I want to make everything on your site so far!! 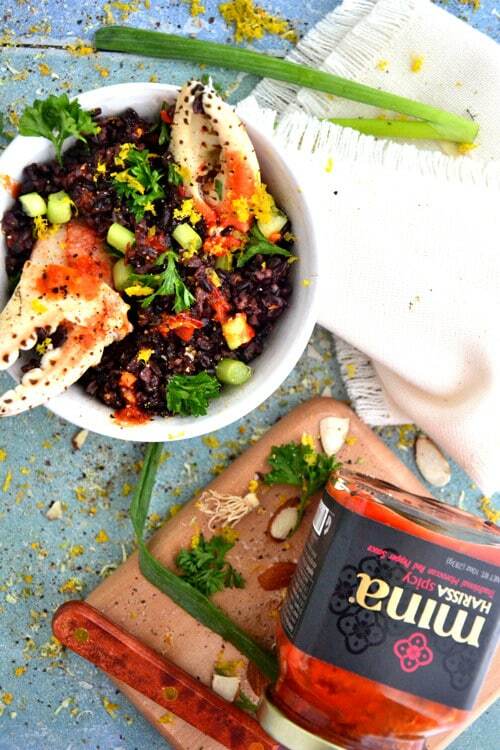 It’s so yummy; spicy but great to spice up plain grains and also a nice touch to add atop tacos and burritos too!